Note that the same holds also for the external angle bisectors. ∠ACE = ∠CAD = ∠BAD = ∠AEC. 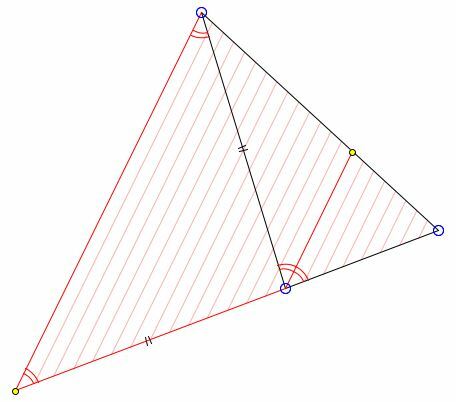 This property of angle bisectors is one way to show that the three angle bisectors in a triangle meet in a point. The result is an immediate consequence of Ceva's theorem. Last note: the converse theorem holds as a matter of course, because there is only one point on a given segment that divides it in a given ratio. Thus if a point divides the base of a triangle in the ratio equal to the ratio of the sides, it is bound to be the foot of the angle bisector from the apex.